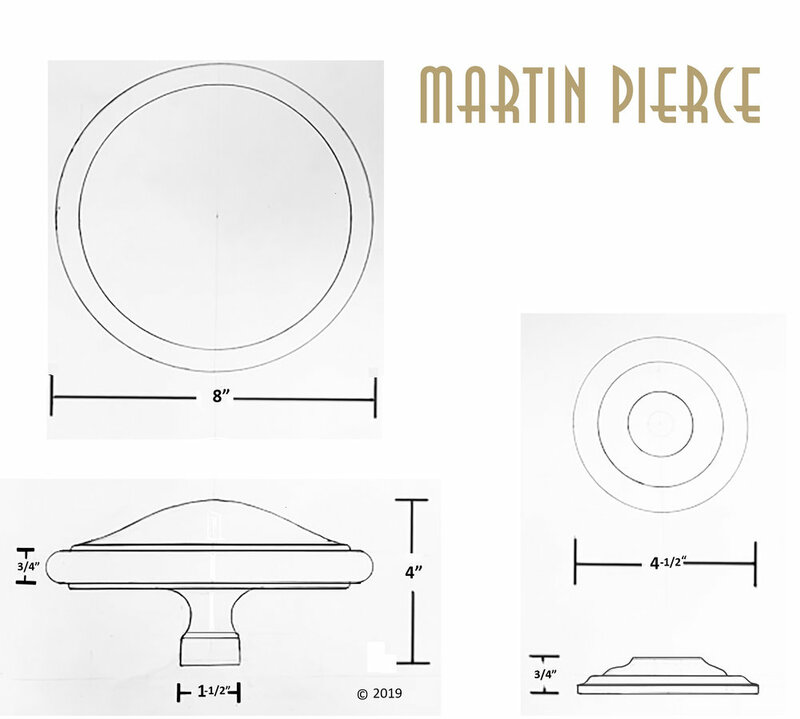 We have just completed casting and machining 8” diameter knobs for the entry doors to an upscale Connecticut residence. Although The handle design was minimalist the knobs were cast in steel and hand polished to create a subtle but beautiful contrast to the dark doors where they will be mounted in the center panel. In the picture below, we have created a mock-up of what the entry sets will look like. We began the process by discussing with Fletcher Development the function and style of handle and determined that there would be 2 knob sets, one that would operate and release the custom mortise lock made by Accurate Lock with second set being fixed as through bolted dummies. We chose to cast these in 316 stainless steel which is a corrosion resistant very durable alloy. We then created 2 wooden patterns one for the rose or escutcheon and one for the knob itself both of which were turned by hand on a manual lathe. The patterns were coated with primer to fill in the wood grain and flexible rubber molds encased in rigid plaster were made. The pattern and mold making process could have been eliminated had we opted to make quick cast stereolithographic prints for all the knob sections. 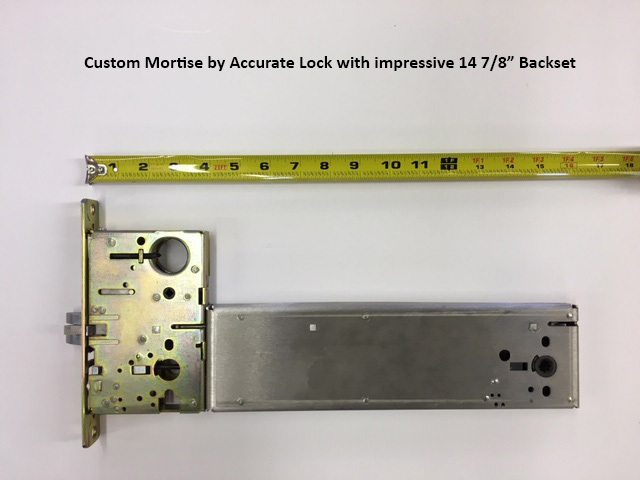 Once cast, the operative set had to be machined to function with a custom mortise lock made by Accurate Lock for a door that would have a 14 7/8” backset. The backset is measured from the edge of the door to the center of the door knob. The knob was machined and fitted with a custom spindle that was designed to slot into the mortise and thereby throw and retract the latch when the knob is turned. The escutcheon plates for the knobs were machined so that connecting bolts could be attached to the exterior knob, pass through the lock body and connect to the interior knob. While the escutcheon plates could have been surface mounted this would not have provided a firm support for our 8lb knobs. As the mortise body was 7/8” thick and the door was 2 ¼” deep , surface screws, had they been used would have been insubstantial at ¾” in length. The body of the lock was customized by Accurate’ s experts to accommodate our though bolts and we bench tested it with our castings to ensure all the moving parts were aligned. We have recently been commissioned by a home owner and a designer to create custom cabinet knobs and pulls for their respective bedroom and kitchen. The designer approached us with the task of creating 3 styles and sizes of cabinet knob to replace and supplement the ones in the home owners period property. In this case the existing original pieces were in excellent condition and could be used as patterns for a sectional mold that was constructed in silicone rubber. The second commission was to create a completely new cabinet pull that would use the client’s distinctive family cattle brand as a model for the cabinet doors and drawers. 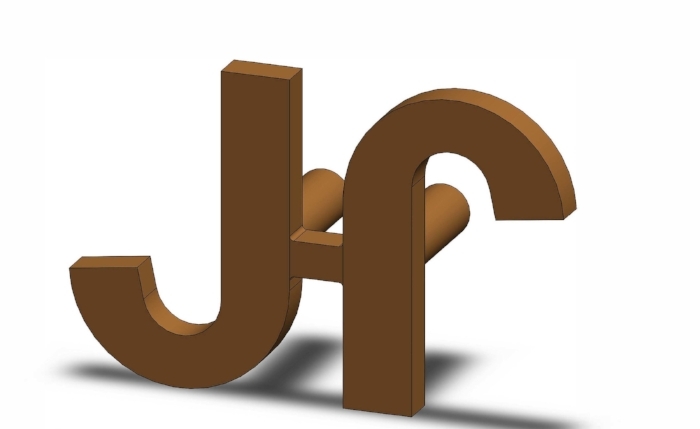 The client did not have a physical piece that could directly be used to form a mold, but he did have a pdf file of the family font and from this we were able to create a 3D CAD model. Both projects will be poured in stainless steel using the lost wax method rather than using 3D Stereolithographic printing. 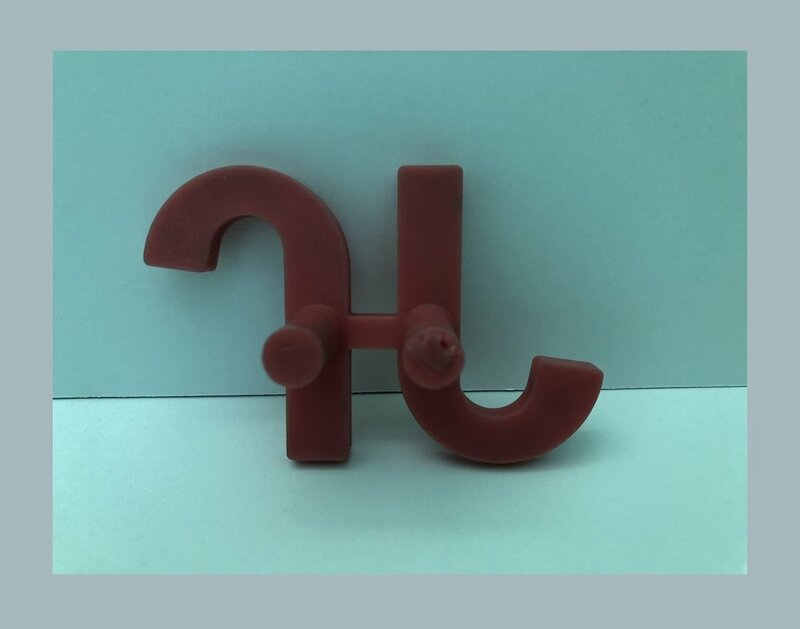 As the molds for both projects are relatively simple one-part molds the upfront costs for design adaptation and mold creation were relatively low and added little to the per unit cost of the pulls. The number of units ordered was also modest ranging from 50 to 75 pieces, but it will be was enough to cover the cost of pouring a smaller crucible of steel. We are currently making a custom door handle that will be hollow and will be lit by an LED strip which will be positioned inside the cavity of the handle. As the decorative details that form the theme of this will be cut out of the pattern we decided to make the hollow sphere by hand. If the pattern had been a simple and uniform geometric shape then we would have turned to 3D printing and created an SLA resin print from a CAD file. We will be working with 3D printing later to develop a light diffuser but will cover that topic in a subsequent post. For those who are new to wood carving or are physically tired of laboriously removing large areas of wood from a block of wood then I would recommend using a mechanically assisted wood carving tool. There are several on the market but we use the automach wood carver available from Woodcraft. When we were more focused on furniture we used several of these to help speed up the carving process and they were invaluable in adding textural chip details to our Hedgerow dining chairs. While the mechanized chisel is useful we revert to hand chisels when adding very fine detail and when we need a larger wider angled blade. We have shown both methods in the video featured here. If you play the video you will also get a glimpse of the raven sculpture’s feet in the background which is an ongoing video project that we will be adding to soon. What Do We Mean by Custom Door Handles? We decided to launch 2017 with some notes for designers who may be looking for custom door handles and hope to explain when custom work is a viable option. To begin with, for many people, the term “custom” is used to describe the production of a piece for a specific customer, in other words it is made to order for that customer and not a stocked off the shelf item. In this sense, all of our work is custom as we make every piece to order and each handle is cast, machined and finished according to the designer’s requirements. In this context while the product may be made to order, the patterns, molds and tooling jigs already exist hence the relatively short lead time of 4 to 6 weeks. The term custom is also used to describe a product that we already make but that needs to be adapted or modified to fit the designer’s specific site conditions. In this context, the viability of adapting an existing piece is determined on a case to case basis. The first consideration is whether the existing mold can be used to create a wax replica that can be modified to achieve the required adaptation. For example, if a designer has a narrow door stile then she made need a narrower escutcheon plate to fit the door comfortably. The grapevine lever set and our large lizard handles have both been customized in this way and the wax replicas were re-shaped by hand to remove ½” to ¾” from the base of both escutcheon plates. Clearly this takes time and not all styles lend themselves to being so adapted. Designing and often re-designing a piece. Creating full scale drawings showing the piece from several perspectives. Creating a 3 dimensional pattern – one for each piece, if the design calls for a right and left directional piece, then two patterns will be needed. Creating a rigid mold which will be used to create wax replicas of the original pattern and will be used in the lost wax process to create either bronze or steel castings. The above steps add considerable time and cost to the production of the piece but if it is a piece being ordered for multiple doors then these costs can be amortized over the cost of the project. As a large portion of our door handles are cast in bronze we have the ability to add subtle shading to the pieces by oxidizing them and then sealing them with oil and wax. However, those of you who are art collectors will also know that bronze can be finished with more sophisticated colored patinas. Some of these colors, specifically Verde Gris, will often develop naturally on bronze and we have all seen the beautiful blue green hues on the domed roofs of old churches and civic buildings that have developed after decades of exposure to the elements. As our time scale does not permit the patina to develop naturally we are able to create several colors of patina by applying pigments directly to our bronze. To ensure an intense color that permeates the surface we heat the bronze up to 200° and apply the pigment by hand often with a very fine brush. As you can see from the picture below we add a pea-green pigment over the body and toes of our lizard door handle to approximate the color of the Anole lizard. We use these hot patinas typically on our nature inspired door handles and cabinet pulls. For an autumnal appearance on our sycamore leaves we use an ox red pigment and for our wasp cabinet pulls we turn to a mustard pigment. Our use of hot patinas on bronze began when we started making our wasp cabinet pulls for our limited edition Ascot series of case goods. The furniture pieces in this collection are all decorated with vine leaf motifs created using a form of japanning, a technique that uses gold leaf over casein to create a raised motif which is then hand painted with colored glazes made by suspending pigments in turpentine. The bronze wasps, some with closed wings and the leader with open wings were made as the finishing touch to the Ascot Highboy. At long last we are making videos for our custom door handles and will be sharing these with you both on our new Video Gallery and on YouTube and DailyMotion. The first video was shot on location at a private residence and features our Lizard Entry Thumb latch set. The big advantage to showing our custom hardware in this format is you get to see and understand what we mean by “functional art”. The lizard sculpture acts as a large bronze door pull and you grip the body of the lizard to open the door or in this case front gate. Above the lizard there is a sculpted bronze back-plate reminiscent of stone, on which a butterfly is perched. The butterfly is also a functioning thumb latch and when depressed it opens the gate by releasing the mortise lock. On the reverse side or inside of the gate we used a smaller lizard sculpture to act as the door lever and to continue the natural theme mounted the lever on a bronze back-plate styled to resemble tree bark. Lizard food, in this case a small beetle, is used as a whimsical bronze turn piece that functions to either open or close the deadbolt. As the lizards have been made as lefts and rights they will also will work well on door double doors or gates. In this particular project we created custom grills at the top of the gate in the form of flax stems and appropriately added a left and right bronze frog to complete the entrance. As Martin Pierce is also a wood carver he carved a wooden raven head to house the chain for the house bell. While I hope you find this description clear I hope you will agree that the video does a better job of capturing the three dimensional reality of this set.